Downloads are disabled. This site remains only for documentations' purposes. Please note, that this software was written for Mac OS X 10.2 with 10.3 in mind and does not support Macs with Intel processors. SouthernReel is a program for displaying and recording videos provided by almost every video camera on computers running Mac OS X and supported by Quicktime. It is just another program for watching the outcome of your video camera, like a DV-camera, the iSight, another firewire camera, or one of those cheap USB-webcams. Connect a camera, start the program and watch the video or record a clip. The most distinctive feature between these programs is the design of the start/stop button. The real power of SouthernReel is the support of multiple cameras. If you have more than one camera, you can watch almost all cameras you have connected and started. 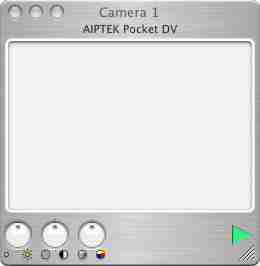 Camera applications are commonly based on a one-to-one assumption, meaning that one and only one camera is able to work on one and only one computer. If you have one camera, you're fine. Plug in that camera and watch what happen. In most cases one program launches itself, usually "iMovie" or "iChat AV", and shows the running video, always demanding that you'll use the camera on the computer as desired. From the viewpoint of the camera this seems reasonable. The catching device feeds the attached program exclusively, meaning that any other program can't see the camera until the program stopped and uncaged the camera. Only one program at a time can establish a connection to one specific camera. There is nothing to do about it now. Even iMovie and Final Cut can't share one camera. From the viewpoint of the computer this one to one connection is commonly assumed, but not mandatory necessary. To overcome this assumption SouthernReel is created and designed as viewer for multiple cameras. Therefor it should support any numbers of QuickTime-compatible video cameras. To access one specific camera from a computer a special piece of information is needed, an ID. To address a specific device each camera must be uniquely identified. The feature to access this number is introduced in Quicktime 6 (VDGetUniqueIDs). Firewire cameras have a unique ID as part of their standard. USB cameras, including USB 2.0, usually do not have IDs. You may want to use the free macam-driver. With this driver SouthernReel is tested on an orignal tangerine ibook and two USB-cameras. For more information please read the section 'Limitations'. The most important feature is the main camera view. Every attached camera can be set as and shown inside the main window simply by selecting the associated video image. Everything shown in the main window can be recorded as well, including textual informations like camera, time and/or date. Other features are the settings inside preferences. The window appearance and behavior can be changed in various ways depending on the functionality, from textured to plain background, movable or not, accepting a first click, titles etc. Uncommon is the tool to manipulate the size of the video in pixel or the grabbing size allowing to recorded movies in every size from 96 x 72 to SVGA. Embedded text informations are rendered directly into the video stream, with position, size and colors are almost free of choice. A lot of savings options are installed now, manually or automatically saving, all local available codecs (short for: 'compressor and decompressor') are selectable and can be customize for the use in the save panel, and every recorded movie can be watched in a movie-player, if desired. The set or change features examine the 'Preferences'. A lot of functionality is hidden there. While working with cameras and live video streams should concentrate on the movies, not on the button. This program should support every video camera connected through either a USB or firewire with its appropiate driver supporting the Quicktime. However, it should. Real life is just another story. I've tested only 3 cameras, a Sony DV-Camera, a Aiptek Pocket DV-Camera and a Kensington VideoCam. 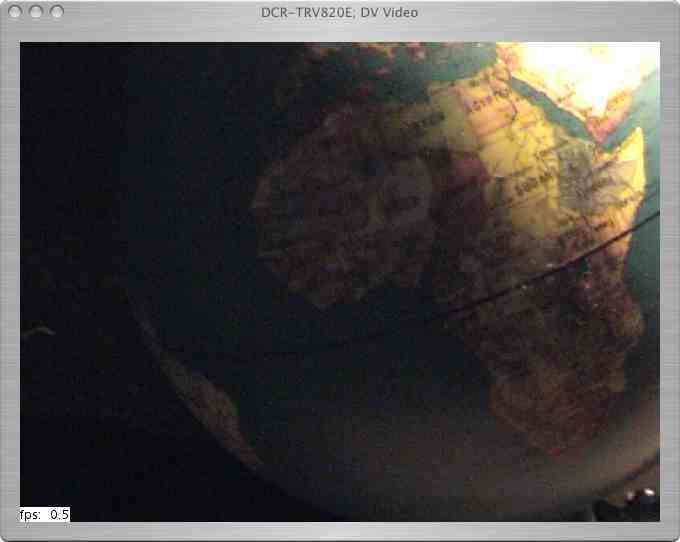 While the DV-camera uses the default DV-Video driver from Apple, both USB-cameras are connected through macam, an opensource USB-driver for Mac OS X. This driver is, as is the only alternative driver from IOXperts, installed as Quicktime component. The iSight-camera, first tested only in an Apple Store, is now supported. However, there are limitations not to ignore. Please read the section 'Limitations'. Do not use SouthernReel unless you have more than one video-camera. Wait until the download is complete. If your web browser and system are properly configured, 'Stuffit Expander' will launch to uncompress the file. If this does not happen, locate the 'SoutherReel.sit'-file in the Finder and double-click it to open 'Stuffit Expander', or start the program manually and open it from there. Locate the 'SoutherReel.app'-file in the Finder, usually at the same place as the downloadede file, and simply drag the file to your Applications folder (or wherever you would like to keep it) to install. 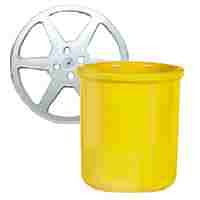 Once SouthernReel is installed you can safely dispose of the 'SoutherReel.sit'-file that you've downloaded if you choose. Double-click the SouthernReel icon in order to begin using the application. You may also wish to drag the icon to the Dock for easy access. Now its a good time to try to access your video cameras. Pressing the square button will, if possible, start all available cameras and open them, all in one or each one in single window. Either way, the output provided by all cameras is displayed on your screen in realtime (or in a timely manner according to your underlying hardware). 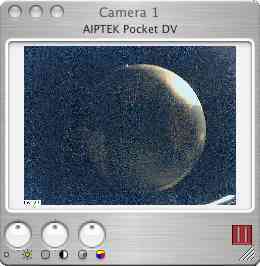 One view, the view of the main camera is also displayed in the main window. Clicking on another camera will set that camera as main in the main view. To record the movie, simply press the triangular red button in the upper right corner of the main window. A save-panel might pop up, and the button is changed to a blinking red square button, indicating that a movie is recorded. Pressing the square button again will stop the recording and a new window with a movie-player might pop up, depending on your settings. To stop the data-transmission from your cameras, simply stop them separately, or all at once using the big square button. This put every camera on hold, but none of the cameras is released. Theoretically this could be done. However if another program gains exclusively access about a camera used by SouthernReel the outcome is unpredictable and errors may occur. Don't use SouthernReel in combination with any other video capturing software. You may damage your camera and/or your computer! As I got more and more involved in video programing I realized that support for multiple cameras is not around for Mac OS X. This was reason enough to get started, because I really needed information about the usability of different video cameras for some other projects. Programming my own video capturing software was not as easy as I had expected. Especially the use of QuickTime, a reminder of the former Apple system, which does not fit well in the Cocoa environment, produced some headaches. However, now the work is done and has emerged into SouthernReel. There are 4 different types of cameras: USB (now USB 1.1), USB 2.0, Firewire-DV and IIDC cameras. All types have their limitations. By definition of their standard Firewire cameras do have unique IDs. There are two different types: DV-, and IIDC-cameras. The Apple DV-driver provides only one usable slot or firewire channel for DV-cameras, because the channel number is hardwired into the driver. No use at all, even if you can grab the ID and the bandwidth is about 100 Mbps with compressed audio and video. The newer IIDC (Instrumentation and Industrial Control Digital Camera) standard also provides support for multiple cameras with uncompressed data, and so does the Apple IIDC driver, for example in combination with the iSight. Here the limiting factor is bandwidth. An iSight-camera uses nearly the full amount of bandwidth the firewire bus can provide, audio not included. Ichat users may have noticed that more than one camera is selectable, but even iChat never accesses more than one camera at a time for streaming. This situation is unsatisfying, on one hand a driver logically not capable of dealing with multiple cameras, even though these cameras are using compression, on the other hand a working driver with physical limitations. Without additional hardware and/or more sophisticated configurations the number of cameras attached to one computer remains limited. General technical support for SouthernReel is not available. It would simply take too much of my time. However, if you have done your homework (i.e., read this document and other documentations), if your problem is with SouthernReel (as opposed to being a problem with Quicktime, cameras or other products), and if you are polite and reasonable, I will do my best. To make comments or simply drop me a mail, please do hesitate before you make your message available for (SouthernReel at lonsing dot com). To download SouthernReel, click on the button. The use of this program is free. Copyright 2004-2017 Werner Lonsing. All rights reserved. All trademarks are the property of their respective holders.